Institute for Creation Research, 120 pages. For the longest time, we have all been taught that the great age of the earth and its rocks is an established fact. However, close examination of the isotopic dating methods instead shows a colossal manipulation of data covered by an elaborate Orwellian cover language. Once the radiometric dating methods are examined in their geologic context, it soon becomes obvious that the ages they indicate cannot be taken seriously. This book is the product of 3 years research, and is supported by nearly 500 references from the geologic literature, almost all of which date from 1980-1999, and most of which are from the 1990’s. The book is thoroughly indexed, and includes a list of study questions. * Debunks isotopic-dating claims, such as the ones about discrepant dates being rare, dates being self-checking as to accuracy, the majority of dates being concordant, the million-billion year ages obtained validating this magnitude of ages, alleged “younging up” in dates, etc. * Introduction by Dr. Henry M. Morris. Shows why the age-of-earth issue is an important one. Refutes the canard about the questioning of dating methods being a hindrance to the Gospel. *Proves that isotopic dates DO NOT converge on an assumed age of 4.5 billion years for earth. *Documents isotopic dates far in excess of the 4.5 Ga figure. * Proves that discrepant and discordant dates are the RULE, not the exception. geologists commonly backpedal on opinions of which particular dates are supposedly valid. serious doubt on the assumption that isotopic systems could remain closed for millions of years. Ar-Ar spectral method has not fulfilled its expectations. Gives examples of dates rejected in spite of producing a flat Ar-Ar release pattern. * Examines U-Pb dating of zircons, showing the highly contradictory dates usually obtained. Proves the ad hoc nature of deciding which zircons are primary and which are xenocrysts. frequently occur by chance, thus vitiating the argument that concordant results almost certainly are valid. The Following is a Study Guide, Using FAQ’s, For the Book: The Mythology of Modern Dating Methods, by John Woodmorappe, 1999, (published by the Institute for Creation Research). accepting the Gospel? (p. 5). truth, and to use the compromise itself as a weapon against true Bible believers? (p. 5). speaking the truth? (pp. 27-30, 32-33, 71, 78-79, etc.). to believe them? (p. 3). for the Phanerozoic geologic column? (p. 13, 42-43, 50). in place to force agreement on “correct” radioisotope dates? (pp. 13-15). True or False: All of the geochronometric dating methods converge on a 4.5 Ga (billion-year) age for our planet? they produced results congenial to uniformitarian thought? (p. 34, 36). “credible” and “non-credible” categories? (p. 37, 41-45). particular dating results? (p. 37, 39-42). reliable and which one will not? (pp. 45-47). consistently indicate essentially zero ages if the earth was only a few thousand years old? (p. 18). proof for the validity of the dating methods? (p. 18, 23). dependent upon faunal ages to check their presumed accuracy? (pp. 7-8, 42-43, 50, 57). (pp. 60-3). the two systems tacitly assume that the other one is valid? (pp. 54-56, see also p. 9). agreement with the other two systems? (pp. 54-56). procedure? (p. 8, 37-46, etc.). data, and independent of any uniformitarian geologic interpretations? (pp. 43-44). one dating method? (pp. 29-30). acceptance of the reliability of a dating method on a given material? (p. 36). 26). When apologists of isotopic-dating methods assert that all discrepant isotopic results have a rational geologic explanation that corresponds closely with the known geology of the region, are they speaking a partial truth, a trivial truth, or both? (pp. 8-10, 75, 77, 81, etc.). 27). Does the geologic complexity of Precambrian terrains excuse the discordance of isotopic dates obtained from them? (p. 12). 28). When uniformitarians tell us that isotopic geochronology leads to testable hypotheses, what are they actually saying? (p. 8, 35). 29). Begging the Question: Where can we see the Law of Superposition employed to reject non-conforming dates, and then hear that isotopic-dating methods must be valid because they conform to their stratigraphic context? (pp. 20-21, 43, 46, 50, 54). 30). Even if all isotopic dates did show a local progression in conformity with the Law of Superposition, would one be therefore justified to leap to the conclusion that isotopic-dating methods are therefore validated? (pp. 20-21). 31). 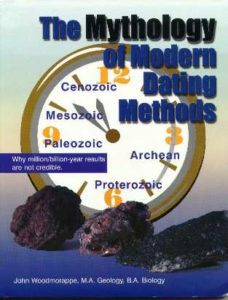 If conventional geochronometric dating methods are invalid, why are they still being used? (p. 16). (Applies to K-Ar, Ar-Ar, Rb-Sr, U-Pb, Sm-Nd, Lu-Hf, Re-Os, and FT). 32). What of the claim that, as analytical tools improve, the validity of isotopic dating is strengthened? (pp. 7-8, 73-74). 33). If we point out that uniformitarian geochronologists often don’t publish discrepant dates, are we thereby accusing them of being dishonest? (pp. 15-16). 34). Don’t lead-isochron dates from the earth, and from meteorites, themselves establish the earth’s age at 4.5 billion years? (p. 24). 35). Fact or Wishful Thinking: Excess argon (in K-Ar and Ar-Ar dating) is a trivial phenomenon? (p. 3, 30-32, 41). 36). Is it true that the assumed equilibration of magmatic and atmospheric argon gas is a well-founded assumption? (pp. 30-31). 37). Most recent volcanics give essentially zero K-Ar ages. When uniformitarians claim that this proves that excess argon is infrequent and unimportant, what biased assumption are they tacitly making? (p. 31). 38). Reality or Rhetoric: On uniformitarians’ own terms, do Rb-Sr isochrons that fail to indicate the correct age of the rock occur infrequently? (pp. 32-33). 39). True or False: Inherited (xenocrystic) zircons, a source of U-Pb results which are “too old”, seldom occur? (p. 29, 33, 82-83). 40). Are tuffs and bentonites largely exempt from the xenocrystic-zircon problem for U-Pb dating? (p. 33, 84). 41). When some anti-creationists assert that glauconite dating has been abandoned, and insinuate that I am being dishonest in bringing up the dating of glauconite, what does this tell us about how informed and/or honest they are? (p. 2, 9, 39, 78). 42). Can it be said with a straight face that conventional K-Ar dates are self-checked for validity and accuracy? (pp. 37-57). 43). Is it correct to say that reliable results can be predicted for unaltered samples of rock? (pp. 46-47). 44). On uniformitarians’ own terms, is potassium content a good reliability criterion to screen out unreliable K-Ar dates? Conversely, is high potassium contact a near-guarantee for the accuracy of K-Ar dating results? (p. 8, 45, 47). 45). On theoretical grounds alone, are unrecognized xenocrysts likely to have little influence on the magnitude of K-Ar dates? (p. 49). 46). Is it true that xenocrystic crystals (in lavas, tuffs, and bentonites) can invariably be identified and removed before the host rock is dated? Or is a xenocryst labeled as such on an after-the-fact basis because the date from that mineral grain had turned out unacceptably old? (p. 48, 82-84). True or False: Interpretation of discordantly-young K-Ar results, from plutons, as “cooling ages”, is corroborated by independent geologic evidence? (pp. 10-11). Are fission–track (FT) dates, most of which are “too young”, unambiguously interpreted in terms of annealing caused by geologic heating events, or are such presumed events invented as an ad hoc basis precisely because the dates are “too young’? (p. 10, 12, etc.). Are uniformitarians at least following a self-consistent methodology when they tell us that “excess argon” can independently be ruled out if the K-Ar results are homogenous over a wide geographic area? (p. 49). On uniformitarians’ own terms, is reproducibility and consistency of isotopic dates proof for their presumed chronometric validity? (pp. 43-44). Can we believe the claim that mineral-pair concordances, by minerals with different isotope-retentive closure temperatures reliably indicate the correct age of the dated rock? (p. 50, 57-58). True or False: If a U-Pb dating result on a zircon grain is reproducible, it is thereby self-checked, and must necessarily give a reliable crystallization age for the host rock? (p. 44, 50). 53). When uniformitarians argue that concordant results by different dating methods are virtually conclusive proof for the accuracy of the dates, are they at least using their own argument in a self-consistent manner? (pp. 50-54). All things considered, is the closed-system behavior of K-Ar and Rb-Sr systems, over the assumed millions or billions of years, a robust scientific assumption, or is it closer to wishful thinking? (pp. 57-60). When it comes to closure temperatures, are the tested high temperatures necessary to cause open-system behavior in rocks and minerals ipso facto evidence for the uniformitarian belief that isotopic dating systems must have remained closed systems for millions and billions of years? (pp. 57-59). As a corollary to the previous question, is a significant thermal event the only way in which a rock or mineral can become an open system to the isotopes used in presumed age determination? Conversely, what is the Achilles’ heel of all the dating methods? (pp. 58-59, 81). Studies have been conducted on patterns of “rejuvenation” at contact-metamorphic aureoles. Do these patterns accredit the premise about isotopic dating systems likely remaining closed systems over millions to billions of years? (p. 59-60). Even if we were to grant the uniformitarian belief of an old earth, could we nevertheless discount the validity of isochron-based dating systems by empirically questioning the central assumption of the initial isotopic homogeneity of consanguineous magmas? (pp. 61-62). Fact or Myth: The onetime consanguinity of magmas, a foundational assumption behind all of the isochron-based dating methods (Sm-Nd, Rb-Sr, Lu-Hf, Re-Os), is readily determined? (pp. 62-63). Regardless of dating assumptions, does the choice of points which will be placed on the isochron diagrams themselves at least follow from a rigorous and objective methodology? (p. 63). True or False: The fact that points are collinear on the isochron diagram validates both the method and the individual dating result obtained? (p. 59, 63-64). “Superior Isochrons”: Failing the previous argument, are uniformitarians correct when they say that the existence of strongly-collinear points on an isochron diagram prove the age-indicative validity of that particular isochron? (pp. 64-65). What is the significance, if any, of situations where the MSWD value for points on an isochron is very low? (p. 64). Does the value for initial 87/86Sr ratio in a Rb-Sr isochron determine its chronometric validity? (p. 65). Are apologists for isotopic dating speaking the truth, or are they just blowing smoke, when they want us to believe that true Rb-Sr isochrons can easily be distinguished from those resulting as an artefact of mixing effects? (pp. 39, 44, 70-71). Are uniformitarians correct in asserting that inverse plots of isotopic ratios objectively distinguish age-indicative isochrons from mixing lines? (pp. 69-71). Fact or Myth: On uniformitarians’ own terms, even if K-Ar dates are conceded to be easily “rejuvenated”, Rb-Sr isochron dates remain very reliable owing to their resistance to open-system behavior? (p. 30, 32-33, 65-66). Considering their overall rarity, how can “superior isochrons” be explained by complex mixing processes? (p. 71). True or False: The pitfalls of Rb-Sr mineral-isochrons dating is circumvented by the usage of Rb-Sr whole-rock isochrons? (p. 66). Is to correct to say that, just because REE’s (rare earth elements) are presumably immobile, Sm-Nd isochrons dates are therefore a highly reliable indicator of a rock’s age? (p. 59, 66-67). In like manner to Rb-Sr isochrons, can geochronologists objectively determine, on their own terms, which Sm-Nd isochrons are fortuitous, which are mixing lines, and which are supposedly indicative of the correct age of the rock? (pp. 70-72). What assumptions are there behind the uniformitarian claim that Sm-Nd model ages date the time since the formation of earth’s crust in different geographic areas of our planet? (p. 67). What are some of the flaws of the new lutetium-hafnium (Lu-Hf) dating method? (p. 58, 68). Reality or Rhetoric: On theoretical grounds alone, it fair to suppose that Pb/Pb isochrons likely have remained undisturbed for millions of years? (p. 68). Even if it is conceded that assumptions about atmospheric argon contents are questionable when it comes to conventional K-Ar dating, is the K-Ar isochron technique exempt from such doubts? (pp. 68-69). Even granting its assumptions, what is the Achilles’ heel of the Ar-Ar method and its reputed ability to date rocks and minerals with pinpoint accuracy? (p. 50, 57, 73-74). Can we fairly say that the Ar-Ar method is a virtual panacea for virtually eliminating the interpretative guesswork of K-Ar dating? (pp. 74-75). Has uniformitarian confidence in the presumed diagnostic capabilities of the Ar-Ar method increased with time, or have uniformitarians actually been forced to backpedal away from the early rosy beliefs about the presumed capabilities of this method? (pp. 75-76, 78-79). Is it true that, given the validity of uniformitarian assumptions, the shape of an Ar-Ar spectrum is diagnostic of closed-system behavior over long periods of geologic time? (pp. 74-77). Can apologists for isotopic dating legitimately wish away the difficulties of the Ar-Ar method as “just a tiny number of malfunctioning watches in a sea of properly-functioning ones”? (pp. 78-79). Regardless of whether or not we accept uniformitarian presuppositions, are we forced by the empirical evidence to agree with the claim that the Ar-Ar method at least follows a rigorous and self-consistent methodology for the analysis and interpretation of spectra (or plateaus)? (p. 74, 78). What is the obvious special pleading behind the claim that the isochrons used in conjunction with the Ar-Ar method independently detect the presence of excess argon? (pp. 69-70). In what self-serving sense does the Ar-Ar method solve the problem of xenocrystic contamination in lavas, tuffs, and bentonites? (p. 44, 48, 74-75). What role does selective manipulation of data play in the “resolution” of the ostensibly-correct age of a rock from one of the steps of a “staircase-shaped” 40Ar/39Ar spectrum? (p. 77). Can we say that the 40Ar/39Ar method now allows the testing of glauconite dates for reliability? (p. 78). True or false: If minerals have different argon-closure temperatures, then concordant Ar-Ar results undoubtedly give the correct age of the rock? (p. 78). If adhering to uniformitarian preconceptions, must we conclude that 40Ar/39Ar plateau dates are correct if found to be corroborated by other reliability criteria? (p. 78). Fact or Myth: U-Pb dates on zircons are almost certain to be reliable because such dates cannot be “rejuvenated”? (p. 81). Should we legitimately let the uniformitarian off the hook when he tells us that explanations involving inheritance, or lead loss, are geologically justified whenever the U-Pb results are in fact found to be discordant? (p. 81). Is it true that inherited (xenocrystic) zircons can be optically distinguished from ones which crystallized at the same time as did the host rock? (pp. 82-83). Are uniformitarians at least following a self-consistent chain of reasoning when they tell us that xenocrystic zircons in a granite reliably date the source lithologies responsible for the origin of the crystals? (p. 83). Can a prognosis of the (presumed) reliability of a U-Pb zircon date can be made on the basis of its uranium content? (pp. 83-84). Is it an empirically-verifiable fact that the discordance of U-Pb zircon dates can be predicted on the basis of the metamorphic grade of the host rock? (p. 84). Reality or Rhetoric: Discordance of U-Pb dates can be independently predicted on the basis of the degree of alteration of the zircon crystal being dated? (p. 82). Why is the use of concordia plots a transparent exercise in special pleading? (p. 53, 84). If one grants uniformitarian presuppositions for the sake of argument, can one then truthfully say that the use of concordia plots to interpret discordant U-Pb dates is at least a self-consistent procedure? (pp. 84-85). True or false: The abrasion of individual grains of zircon eliminates the problem of discordant U-Pb dates? (p. 51, 85-86). In what way does the use of the air-abrasion technique on zircons open up a Pandora’s box of uncertainties and assumptions, thus providing a new set of special pleadings for the uniformitarian geochronologist to use at will? (p. 85). What has happened to the claims about the titanate and monazite being particularly reliable minerals for U-Pb dating? (p. 53, 86).